World Headquarters for the DWSUWF Blog has once again temporarily relocated to the Upper Peninsula of Michigan for a couple of weeks. We'll be closing the family camp on the lake and get in some end of season fishing. At some point, my brother and I will don fashionable orange vests and hats, walk around in the woods with a shotgun, and (based on past experience) not kill anything. He is voting for Obama and I am voting for McCain. I'm just wondering if this walking around in the woods with guns thing is really a good idea. 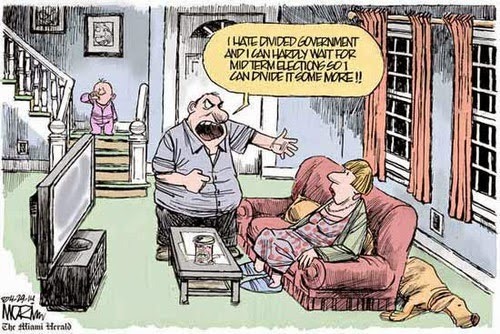 Obama supporters are notoriously unstable emotionally. The blog is not on hiatus, as my intention is to get a few posts out as the spirit moves me and the bass, bluegill, pike, and brookies permit. That would be "intention" as in "road to hell is paved with..." notwithstanding. Last week I learned what the Obama campaign really means by "new politics" and as a result purchased a book for the flight. Just finishing it now and will be writing a review. This Friday night is the first debate. Can't miss that. I'll be reprising the ever popular Live Blogging the Live Bloggers format for the debate. It'll be a challenge from our U.P. operation, but I've done it before, I can do it again. 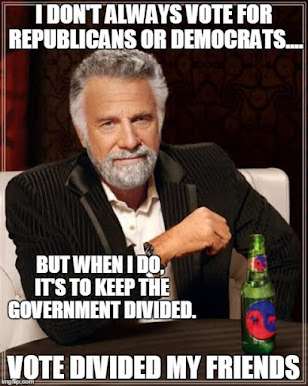 In the interest of preparing this blog for the government mandated Fairness Doctrine that will almost certainly be imposed by the all powerful single party Obama led Democratic government, I am working on a Divided and Balanced™ post of the reasons to not vote for divided government. This post is taking longer and is harder than I thought. Finally, the next Carnival of Divided Government will be the Septimus et Vîcênsimus (XXVII) - Special "Day of Mourning for the End of the Trout Season" Edition which will be somberly posted on or about the first day of October. Submit your blog article at carnival of divided government using our carnival submission form. So is Palin qualified to be president? “I think it’s a stretch to, in any way, to say that she’s got the experience to be president of the United States,” Hagel said. I agree with Hagel. Based on resume, Sarah Palin is no more qualified to be president than Barack Obama. But then, Sarah Palin is not running for President, and Barack Obama is. Kind of a problem, and a distinction that seems to elude the Obama acolytes. I have said before, and will say again: I like Barack Obama. I think we might know enough about him, and I would be comfortable voting for him for President if he first spent 4 or 8 years as Vice-President, as Sarah Palin will. But voting for him for President now? It is like voting for a Jimmy Carter with less experience if Jimmy Carter was a Chicago machine politician. I just do not understand why anyone thinks that is a good idea.